Adrenal gland, Cortex - Degeneration, Cystic in a female Sprague-Dawley rat from a chronic study. The cortex is distended by dilated spaces filled with proteinaceous fluid and/or blood (CD). 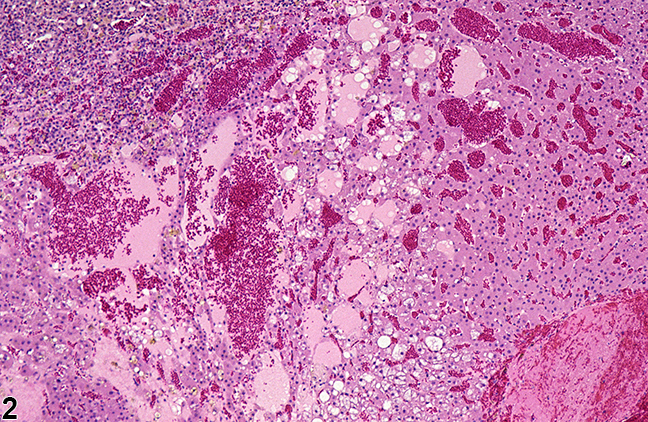 Adrenal gland, Cortex - Degeneration, Cystic in a female Sprague-Dawley rat from a chronic study (higher magnification of Figure 1). Cystic degeneration is characterized by dilated spaces filled with proteinaceous fluid and/or blood and scattered vacuolated cortical cells. 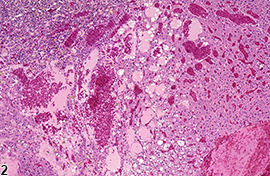 Adrenal gland, Cortex - Degeneration, Cystic in a female Sprague-Dawley rat from a chronic study (higher magnification of Figure 1). Cavitated spaces (C) delineated by attenuated cortical cells (arrow) are filled with proteinaceous fluid. 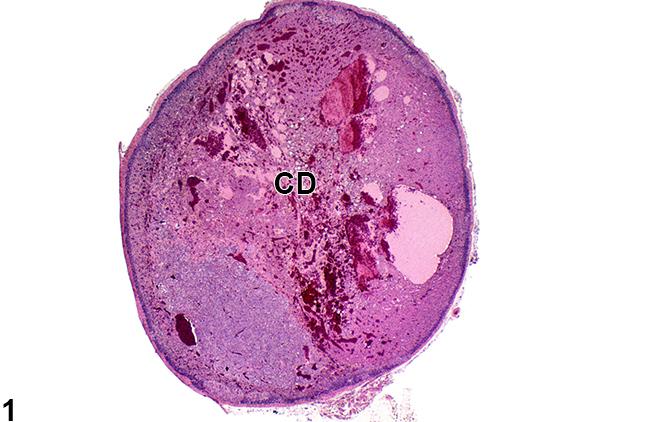 Adrenal gland, Cortex - Degeneration, Cystic in a female Sprague-Dawley rat from a chronic study. Multiple irregular cavitations (asterisk) formed by loss of cortical cells expand and distort the cortex (C) and compress the adjacent medulla (M). 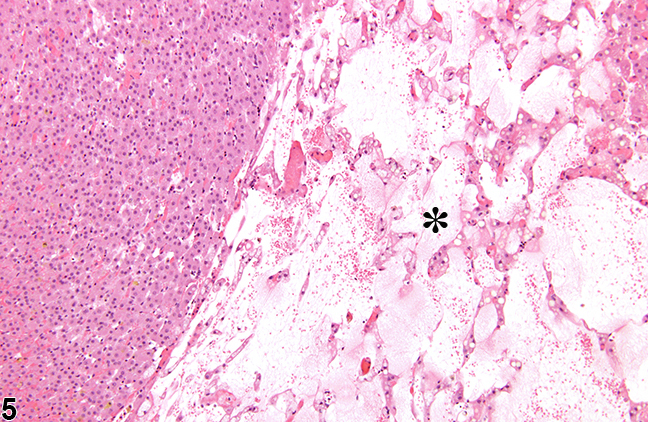 Adrenal gland, Cortex - Degeneration, Cystic in a female Sprague-Dawley rat from a chronic study (higher magnification of Figure 4). 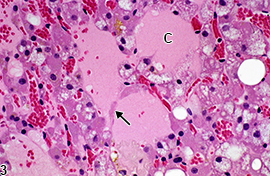 Multiple irregular cavitations (asterisk) formed by loss of cortical cells contain proteinaceous fluid. Cystic degeneration of the adrenal cortex ( Figure 1 , Figure 2 , Figure 3 , Figure 4 , and Figure 5 ) occurs in many strains of rats but has apparently not been reported in mice. Incidences vary with rat strain, with some strains (e.g., Sprague-Dawley, Wistar) exhibiting much higher incidences than others (e.g., F344). 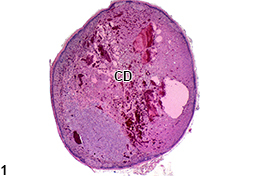 In all rat strains, cystic degeneration is much more common in females than in males. It is usually a spontaneous, age-related change, though treatment-related increased incidences have been reported after administration of certain chemicals. Early stages of cystic degeneration are characterized by small, noncompressive foci of widened cortical sinusoids and dilated blood vessels in the zona fasciculata; cortical cells in the intervening cords can be vacuolated or slightly flattened. 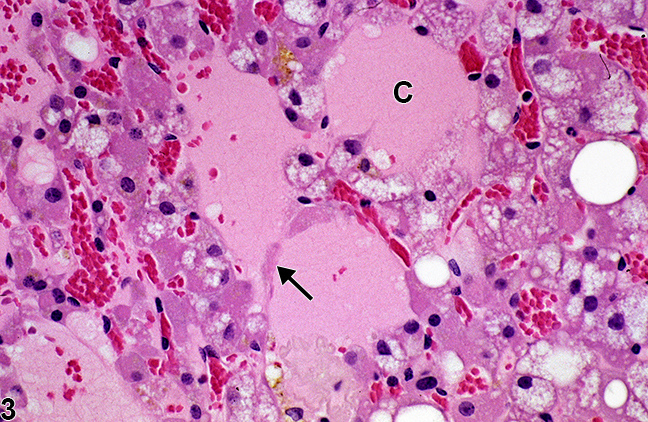 As the lesion progresses, affected areas enlarge and can compress adjacent parenchyma ( Figure 3 and Figure 4 ). The sinusoidal and vascular ectasia progressively becomes more extensive, resulting in large, often confluent, cyst-like cavitations ( Figure 1 , Figure 2 , Figure 3 , Figure 4 , and Figure 5 ) that are filled with proteinaceous fluid, red blood cells, and/or fibrinous thrombi but lack the epithelial lining characteristic of true cysts. Clusters of vacuolated or swollen cortical cells can be scattered among the dilated spaces. Areas of cystic degeneration can also be features of large cortical hyperplastic or hypertrophic foci or of cortical neoplasms; however, in cystic degeneration the number of cells is decreased compared with normal cortex. 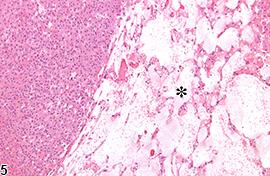 Cystic degeneration of the adrenal cortex should be diagnosed and assigned a severity grade. Areas of cystic degeneration occurring in foci of hyperplasia or hypertrophy or in cortical neoplasms should not be diagnosed separately but should be described in the pathology narrative. If cystic degeneration is seen in both adrenal glands, the modifier "bilateral" should be added to the diagnosis (lesions are assumed to be unilateral unless otherwise indicated). Brix AE, Nyska A, Haseman JK, Sells DM, Jokinen MO, Walker NJ. 2005. 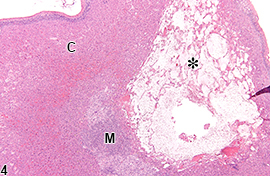 Incidences of selected lesions in control female Harlan Sprague-Dawley rats from two-year studies performed by the National Toxicology Program. Toxicol Pathol 33:477-483. Dohm G, Hohbach C, Mäusle E, Scherr O, Ueberberg H. 1981. Peliosis of the female adrenal cortex of aging rats. Virchows Arch B (Cell Pathol) 36:195-206. Elmore SA, Berridge BR, Boyle MC, Cora MC, Hoenerhoff MJ, Kooistra L, Laast VA, Morrison JP, Rao D, Rinke M, Yoshizawa K. 2013. Proceedings of the 2012 National Toxicology Program Satellite Symposium. Toxicol Pathol 41:151-180. Frith CH, Botts S, Jokinen MP, Eighmy JJ, Hailey JR, Morgan SJ, Chandra M. 2000. Non-proliferative lesions of the endocrine system in rats, E-1. In: Guides for Toxicologic Pathology. STP/ARP/AFIP, Washington, DC. Hamlin MH, Banas DA. 1990. Adrenal gland. In: Pathology of the Fischer Rat: Reference and Atlas (Boorman GA, Eustis SL, Elwell MR, Montgomery CA, MacKenzie WF, eds). Academic Press, San Diego, 501-518. Imazawa T, Nishikawa A, Todate A, Furukawa F, Onodera H, Mitsumori K, Hirose M, Hayashi Y. 2000. Dual effects of prolonged ACTH stimulation on 4-hydroxyaminoquinoline 1-oxide-induced adrenocortical lesions in rats. Toxicol Pathol 28:535-539. McMartin DL, Sahota PS, Gunson DE, Han Hsu H, Spaet RH. 1992. Neoplasms and related proliferative lesions in control Sprague-Dawley rats from carcinogenicity studies. Historical data and diagnostic considerations. Toxicol Pathol 20:212-225. National Toxicology Program. 2006. NTP TR-525. Toxicology and Carcinogenesis Studies of 2,3,4,7,8-Pentachlorodibenzofuran (PeCDF) (CAS No. 57117-31-4) in Female Harlan Sprague-Dawley Rats (Gavage Studies). NTP, Research Triangle Park, NC. National Toxicology Program. 2010. NTP TR-559. Toxicology and Carcinogenesis Studies of 2,3',4,4',5-Pentachlorobiphenyl (PCB 118) (CAS No. 31508-00-6) in Female Harlan Sprague-Dawley Rats (Gavage Studies). NTP, Research Triangle Park, NC. Tucker MJ. 1997. Diseases of the Wistar rat. In: The Endocrine System. Taylor &#38; Francis, London: 183-215.